Author: Metro-Designs, Event & Party Services! Metro-Designs, Event & Party Services! Creative & customized party/event supplies at reasonable prices. Invitations, Party Banners, Party Signs, Party Supplies, Party Decorations and more! Please feel free to contact Metro-Event.com for any special request Metro-Designs specializes in creating & printing visually distinctive marketing materials that increase brand awareness and generate sales for your business. We provide a full range of services including: graphic design, high quality printing, web design, digital photography, photo-restoration, vectorization services, branding solutions and more! 2018 Fun party #1 By Metro-Events! The number 8 has been considered the luckiest number in Chinese culture so 2018 is going to be luck for everyone! That definitely is cause for celebration! This year have a unique party for your son or daughter. Metro-Events has a number of options to choose from. First you need the perfect birthday party invitation. This sweet, magical unicorn invitation, created with a soft pink background and a yellow unicorn with a rainbow horn. This is a fun and magical birthday invitation for your sweet little birthday girl. I remember about 5 years ago I was having a birthday party for myself. Being an adult, I found it was difficult to find anything for adult parties. That same year I started my party shop on Etsy, most of my designs in the past years have been for children’s birthday parties. I started going beyond those and designing some adult invitations! The first set is for the milestone birthdays, 16th, 21st, 30th, 40th, 50th, 60th and 70th. These party invitations are modern, classy and have a mature style to them. Modern, 21st Birthday Invitations. Black, lime green, white and modern party invitations features stylish text with a contemporary look. This is a great invitation choice for anyone’s awesome 21st birthday! Fantastic 40th Birthday Invitations. Forty is FANTASTIC with these modern and sophisticated party invitations. This contemporary party invitation is a classic choice for FANTASTIC 40th birthday! Fifty & Fab, 50th Birthday Invitations. Fifty is awesome with these modern and sophisticated party invitations. This stylish party invitation is a classic choice for an elegant 50th birthday! Classy 30th Birthday Invitations. These classy invitations features a elegant script typography that reads “30, thirty”. This sophisticated invitation is a classic choice for fabulous 30th birthday! Following the milestone birthdays came my personal favorite, color parties! Have your guests where your favorite color to your party or create a different kind of theme using a color. A great example would be the red party invitation, you don’t have to have your guest wear red. Instead have a wine party and ask your guest to bring their favorite red wine for a wine tasting or dinner party. Black Party Invitations. Black and modern party invitations features stylish text with a black on black look. White Party Invitations. White and sparkly party invitations features glitter text with all white. I have really enjoyed the switch up with going from the kids to the adult parties, I always have fun with the kids birthday invitations however I am really loving these adult party invitations… I think I am due for another party! All of our party invitations are available printed or in a digital party file. At Metro-event.com we offer both prints and digital files. Our zazzle shop only offers printed invitations. Please feel free to contact Metro-Events for any custom party ideas. Do you know someone that is retiring soon? Maybe it’s you! A retirement party is a special event, there is nothing in life that we work harder and longer in but our employment. You spend years of blood, sweat and tears slaving away for an employer, once you are finished it’s time to PARTY!!! 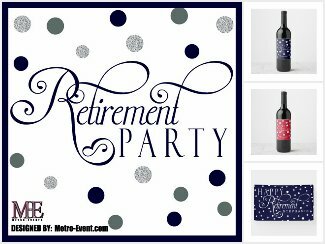 Have the best party ever and impress your friends and co-works with Metro-Events retirement party decorations. 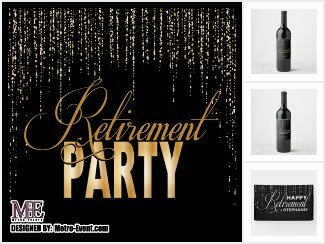 Metro-events on zazzle has a wide variety of retirement party invitations for you to choose from. We have all types of retirement party invitations from golf style to elegant chic. We also have custom party supplies either printed or digital files. If you don’t see something that coordinates within one of our shops please contact us, we will be happy to assist you with getting what you need. Please visit us at Metro-Event.com or MetroEvents on Zazzle for any of your retirement party decorating needs. 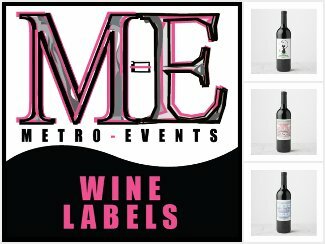 Metro-events now has printed, personalized wine labels available at our shop at zazzle! Now you can customize your parties, events and gifts with cool and festive wine labels! Check out our growing collection that we have to choose from! We also have wine gift sets! Everyone has someone that they have to give a gift to and they aren’t sure what to get them. This set provides a great option for you! We have put together some amazing wine sets that include the following: Custom wine labels, wine stopper, wine charms and wine bags. This makes a great gift for wine lovers and those people that you don’t know what to get! Metro-Events party supplies are all customizable so if you wanted to use this for a birthday, wedding or bridal shower the words can be changed to suite your party type. Please contact us for any customization request that you need! The perfect Shabby Chic baby shower starts with Metro-Events, with invitations, favors, decorations and more! Our Shabby Chic Baby Shower Invitations are available on both Metro-Event’s Zazzle shop and Metro-Events on Etsy. Choose either prints or Digital files to print yourself. Three color options available: Unisex Baby Shower, Baby Shower for Girls and Baby Showers for Boys. You remember how the story began—he asked, and you said yes! Make sure you guests remember the reason for your classy and stylish celebration with party favors and supplies from Metro-Events, “She Said Yes” party collection. The She Said Yes Bridal Shower Invitations are available on both Metro-Event’s Zazzle shop and Metro-Events on Etsy. Choose either prints or Digital files to print yourself. Our She Said Yes Collection Feature a assortment of personalized party favors, personalized decor, posters and more! These pieces are embellished with that little statement that will make a big statement at your engagement party or bridal shower. Want a fun and cultured theme for your party? consider an Arabian Nights theme! This theme is glamorous, colorful and unexpected ~ perfect! 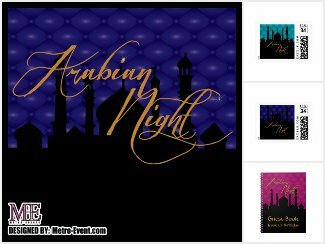 The Arabian Nights Party Invitations are available on both Metro-Event’s Zazzle shop and Metro-Events on Etsy. Choose either prints or Digital files to print yourself. Arabian Nights Themed party ideas any kind of event including corporate events, birthday themed parties, Mehndi party, Bollywood theme party, weddings, Bar mitzvah, anniversary, bridal showers and sweet sixteen parties. 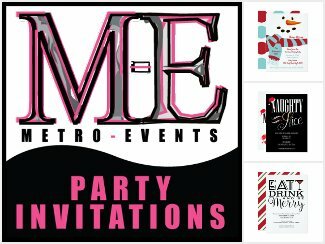 Metro-Events carries a wide variety of party supplies and favors including: party posters, stickers, food and candy, thank you cards and much more! Cowboys and Cowgirls! Party Supplies and Favors. Throw a country western theme party or a cowboy or cowgirl theme party! Lasso everything you need for a Cowboy or Cowgirl theme parties including invitations, posters, banners, party favors and more from Metro-Events. Whether you need digital files or already made party supplies, Metro-Events carries just about everything you need to have an awesome and unique cowboy birthday… And Cowgirl Birthday too! Your little man is on his way! Cute and simple Bow tie Baby shower collection of boy baby shower favors and decor pieces plaid bow ties. Fabulous collection of baby shower decorations, supplies, shower favors, invitations and keepsakes. Have fun shopping for all of your baby shower decorations needs only at Metro-Events. Bow tie Baby shower Digital Invitations are available as well as printed invitations at Metro-Events. 2 color options available, Blue and Green. Shop for More baby shower supplies and party favors on Metro-Events Zazzle Page.